It’s not just square footage that drags down a home’s appreciation. Multiple bedrooms have fallen out of favor now that Americans are having fewer kids. So what would you do with those extra rooms, anyway? 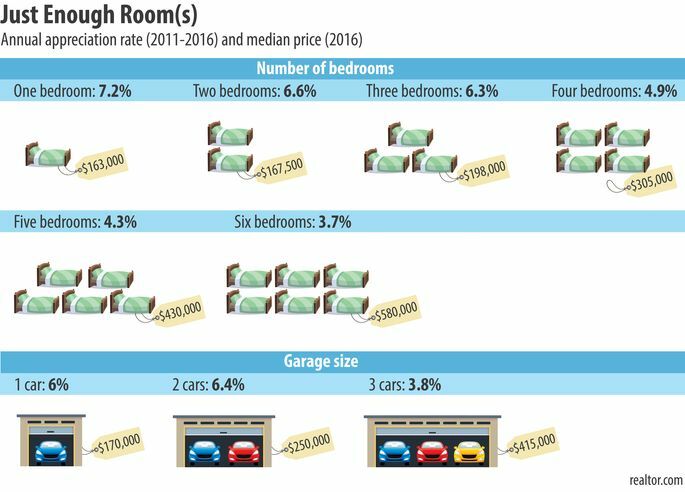 So converting a garage into a bedroom probably isn’t worthwhile, especially since this is one area where people do want a little more room. Two-car garages are still the gold standard, offering the highest annual growth, at 6.4%. It makes perfect sense, considering that an average American household in 2016 had 1.9 cars, according to Nielsen Pop-Facts® Demographics. 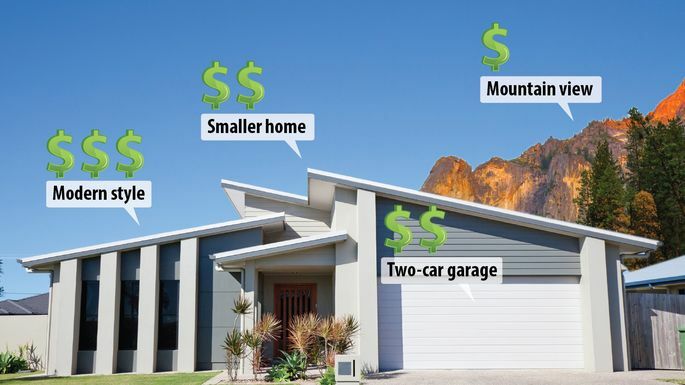 A one-car garage comes in next, at 6%, while three-car garages—a luxury amenity—appreciate at just 3.8%. It’s one thing to prefer a small home; it’s quite another to have a home that feels cramped. How do you make a small space look bigger? Knock down some walls and open it up! Homes with open floor plans appreciate 7.4% a year. And to bridge the indoor and outdoor spaces, a patio is also a worthwhile investment. There’s nothing like putting in some serious summer relaxation time on your patio or deck—sipping a sweet Pappy Van Winkle Old-Fashioned, or firing up a grill for al fresco gatherings. Homes with a patio appreciate 6.8% a year. From elegant Queen Anne homes to humble cottages, architectural stylesoften reflect a buyer’s personal taste—and budget. We found that the styles resonating with the most people have higher potential for appreciation. “Traditional” generally refers to homes with classic designs like simple roof lines and symmetrical windows, along with a welcoming front porch, and often cozy fireplaces. The style enjoys wide popularity, especially in the South, because it’s homey, practical, and often affordable—its median price is $230,000. Homes of this kind appreciate at 5.6% a year. Niche traditional styles, like Craftsman bungalows and Victorians, may tug at the heartstrings of history buffs, but tend to leave regular buyers unimpressed. The responsibility of maintaining a vintage abode can be huge—you can’t just wander into Home Depot and find customized doorknobs. And your favorite IKEA furniture will seem like a horrible mismatch. The Craftsman style is defined by its low-pitched, gabled roofs, exposed wooden structural elements, and most importantly, hand-crafted woodwork. A Craftsman home isn’t cheap to come by—the median price is $336,500—and has not seen rapid growth recently, at only 3.7% a year. The importance of location is a cliche in real estate—because it’s true. Homes located in the neighborhoods most in demand really do appreciate faster. After all, you can gut the inside and paint the outside, but it’s not so easy to move a nice-looking home out of an inconvenient location. And the feature that buyers most want to be close to is public transportation. Homes near train stations and bus stops appreciate 8.4% every year. They’re usually located in more urban areas and are close to restaurants and shopping too. “Buyers want to roll out of bed, walk to the train station, and hop on a train to work within half an hour,” he says. Homes near schools, especially schools with keywords like “top” and “best,” also come with an inflated price tag—the median price is $320,000. That’s almost one-third more than the typical home. But plenty of parents still envision walking to school with their children in the morning. Homes near the most desirable schools appreciate 7.2% a year. Whether it’s snowy mountain peaks or a glassy expanse of blue water, you’ll pay a premium for those stunning views outside your windows. But some sights bring more value to your home than others.